It all started six years ago when a friend and I found ourselves climbing a fence and sneaking into the Nosara tennis club. Â We were eager to play and move our bodies. Football, which used to be the national sport in those days, was no longer an option as most of us were getting ânot so youngâ anymore. âWe need to find a new sportâ, we thought to ourselves. We sneakily climbed in, taking the chance that we might be caughtâ¦ We werenât. Instead we fell in love with the game, signed in as members of the club and started training. Since then, tennis has been the best therapy and a gate into the moment Â for me; itâs a game of presence – you just canât hit the ball right if you are thinking. Â Win, lose or tie. In the moment, there is no one to blame and nowhere to escape. Itâs you and the ball, and you have to deliver. This unique game exposed me to different layers of my personality, some of which burdened me in normal life and some of which uplifted me. It has given me the opportunity to mature and learn about myself and how I handle situations in my life, all within the microcosm of this fantastic game. The pain of losing or the joy of winning are not only because I fail or reach the goal. Itâs a reflection of myself and how I respond to a situation that life has presented me with. The last six years of playing brought with them many moments of looking in this mirror (I didnât break a racket yet, but almost did). Â With those came breakthroughs and moments of clarity that were the sweetest of all – especially when they led to a win. After two years of driving the dusty roads to Nosara, I decided to build our own tennis club in PachaMama. It was not an easy task as we had never built a clay court around here, but with the help of good friends we did it. For the last four years, we have been enjoying a juicy and vital tennis club in PachaMama with daily classes and groups for kids and adults of all ages and levels. This year we have opened a fitness program that allows people to train, strengthen and shape their bodies, and we have more surprises coming soon. Most importantly, we enjoy the game in a meditative way and use it as a tool to stay in shape as well as grow our awareness. Amara’s spiritual journey began in 1997 with recognition that healing is his responsibility. He began exploring different types of therapy and alternative healing. He studied Shiatsu and Chinese medicine philosophy as well as other body work methods. 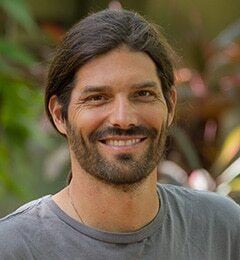 He came to PachaMama in 2000 and completed the Clarity Breathwork training in 2012. He now holds breathwork events and individual sessions. In his work, breath is used as the main tool, as well as other inquiry techniques and trauma healing methods.